Singapore Economic Development Board (EDB), McKinsey & Company, SAP, Siemens and TÜV SÜD have announced a collaboration to support companies, both big and small, scale the adoption of Industry 4.0 technologies. EDB, the lead economic agency of Singapore, will focus on industry development and ecosystem building to transform its industries and create good job opportunities for Singaporeans. McKinsey & Company, a leading global management consulting firm, will serve as a Knowledge Partner with its experience in helping companies undertake process redesign, technology road-mapping and organisational capability development. SAP, a world leader in business software and digital technologies, helps manufacturing companies become more intelligent with end-to-end process agility and business innovation. Siemens provides a holistic and industry-specific portfolio for the digital transformation of the discrete and process industries. It comprises automation as well as Industrial Software, Industrial Communication, Industrial Security and Industrial Services including consulting over the entire lifecycle to support manufacturers to implement their individual digital transformation project. TÜV SÜD, a global testing, inspection, certification and training company ensures Industry 4.0 solutions are safe, secure and reliable. 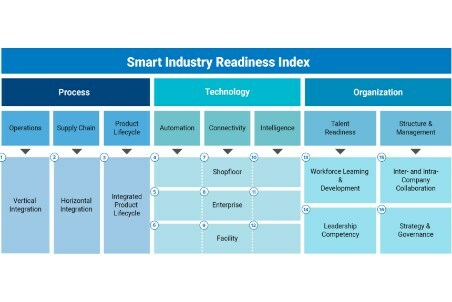 In 2017, EDB and TÜV SÜD launched the Smart Industry Readiness Index, which is a diagnostic tool to help companies assess their readiness for transformation. The Index has been substantially applied in Singapore and is being rolled out in Indonesia, Thailand, India, USA, Europe and Japan. As a next step, EDB in collaboration with McKinsey & Company, SAP, Siemens, and TÜV SÜD will enhance the Index with a computational tool that helps companies identify and recommend focus areas and digital initiatives to prioritise based on their individual readiness score and current financial performance. This “Prioritisation Matrixa”, will be launched at Hannover Messe 2019, alongside a white paper detailing its concept and development.